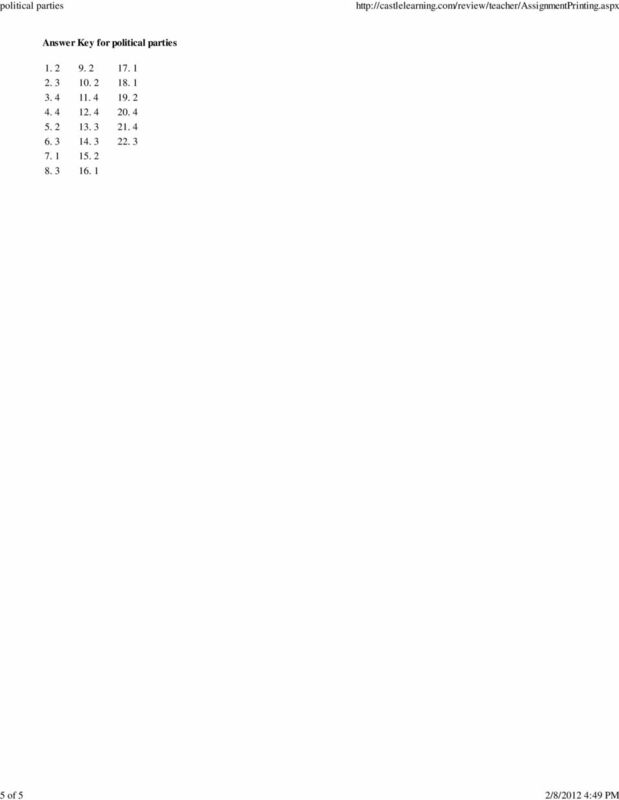 Download "3. addition of the elastic clause to the. 4. start of the first political parties"
1 1 of 5 2/8/2012 4:49 PM Name: The major role of political parties in the United States is to meet constitutional requirements nominate candidates and conduct political campaigns continue a tradition that began during the colonial period ensure that candidates for public office are honest and law abiding Conflicts between Jeffersonians and Hamiltonians during President George Washington s first administration led directly to the end of the Era of Good Feelings decision to replace the Articles of Confederation addition of the elastic clause to the Constitution start of the first political parties In the United States, national political parties began to form in the decade after the adoption of the Federal Constitution mainly as a response to the desire to continue the British tradition of a two-party system constitutional requirement for a two-party political system differences that arose over political and economic issues problems created by westward expansion In the United States during the 1780's, the Federalists were most likely to support continued loyalty to the British Government establishment of a weak national government strengthening of States rights ratification of the United States Constitution 5. Repaying the national debt, creating a national bank, and passing a whiskey tax were economic policies favored by Thomas Jefferson Benjamin Franklin Alexander Hamilton Andrew Jackson 6. Which statement best summarizes the views of Thomas Jefferson? Only the wealthy should be allowed to serve in government. The nation needs a powerful central government if it is to survive. Government is best when it governs least. The United States needs a large military. A. A B. B C. C D. D. What factor most influences people today on who they vote for in an election? Washington and Congress Main Idea With the adoption of the new Constitution, Americans and their leaders had to establish a central government to deal effectively with the challenges facing the new nation. Name: Unit 4 The Early Republic TEST REVIEW Pd: Test Date: 1. List the characteristics of the Early Republic Era: War of 1812, Expansion of the U.S., first five presidents, presidential precedents, etc. The Bill of Rights did not come from a desire to protect the liberties won in the American Revolution, but rather from a fear of the powers of the new federal government. Assess the validity of the statement. Jefferson s Presidency. Warm Up: Summarize the main events of Washington s and Adam s Presidencies. 253. Patrick Henry ( ) One of the main opponents of the Constitution, he worked against its ratification in Virginia. Unit 2: Creating a Nation. U. S. History from 1750 to 1796.
pres dec Name: Class: Date: Multiple Choice Identify the choice that best completes the statement or answers the question. C H A P T E R 7. Launching the New Republic, Which points in Hamilton s economic program were most controversial and why? C H A P T E R 7 Launching the New Republic, 1788-1800 1. Which points in Hamilton s economic program were most controversial and why? 2. What was the impact of the French Revolution on American politics? Read 266 270 Copy down below graphic organizer and list 3 significant powers added to the Judicial Branch. Marbury V.
Washington Heads the New Government President Washington set precidents and transforms the ideas of the Constitution into a reality. Shays Rebellion. Central Historical Question: How did Americans react to Shays rebellion? Name Computer # Date. AIM: To what extent was the Washington administration s response to the Whiskey Rebellion appropriate? 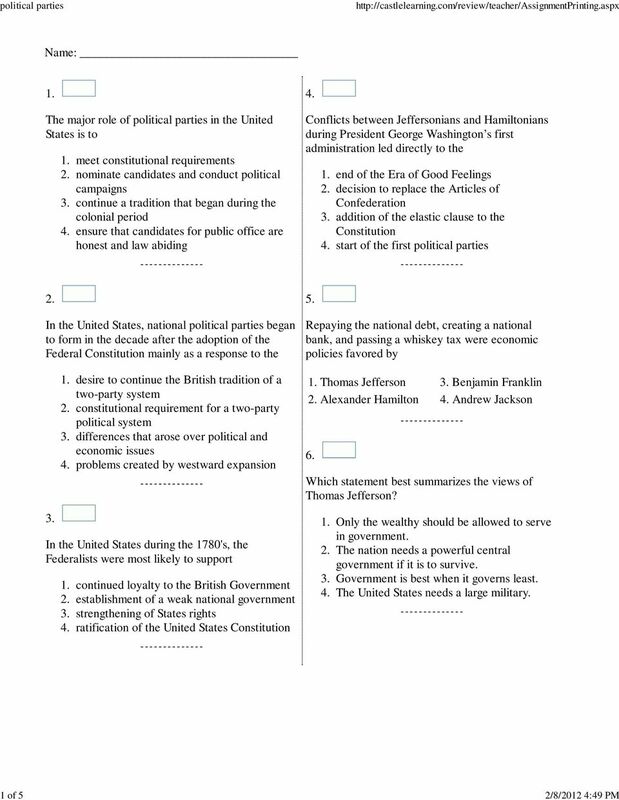 8 th Grade TAKS Review Colonial and Revolutionary Times KEY Famous People: Thomas Jefferson George III Benjamin Franklin Samuel Adams Thomas Paine Who was the main author of the Declaration of Independence? EOCEP Release Items By Standard and Indicator Indicator 1.1 Additional Release Item for this indicator found on Teacher s Guide Which colonial region had the most religious diversity during the 1700s? DRAFT SOCIAL STUDIES American Government/Civics American Government/Civics The government course provides students with a background in the philosophy, functions, and structure of the United States government. Unit 3 Chapter Test. Creating America Grade 8 McDougal Littell NAME. Main Ideas. Choose the letter of the best answer. Party Time! NOT THAT KIND OF POLITICAL PARTIES! Social Studies Lesson Plan- SS.5.C.1.6. Compare Federalist and Anti-Federalist views of government.